Kabuki used to be an amusement performance for Civilians in the Edo period. Have you ever seen Kabuki? There are many people, even Japanese people, who have not seen Kabuki. I guess many people think traditional performance arts are difficult to understand. Kabuki was born as one of the Japanese traditional arts in the Edo period. It was the only popular entertainment. 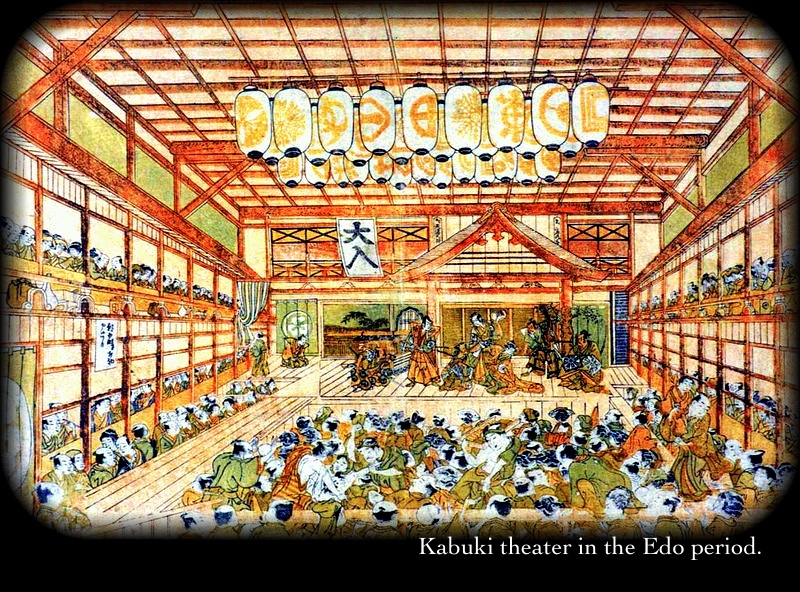 The civilians enjoyed Kabuki as modern performances at the time in the Edo period. It is said that Kabuki began as Kabuki dancing（Kabuki Odori, 歌舞伎踊り）created by Izumo-no-Okuni（出雲の阿国）at Sijō-gawara（四条河原） in Kyoto in 1600. It reached maturity in the Genroku era（元禄期） in the Edo period, having been used for dancing by prostitutes, beautiful young boys and men. Now Kabuki has three masterpieces, "Kanadehon Chūsingura （仮名手本忠臣蔵）", "Sugawara-denju Tenarai-kagami （菅原伝授手習鑑）" and "Yoshitsune Senbon-zakura（義経千本桜）". They succeeded, as performing arts, the Bunraku puppet show（文楽/人形浄瑠璃）in Osaka and Kabuki play-writers took in those methods and stories quickly. 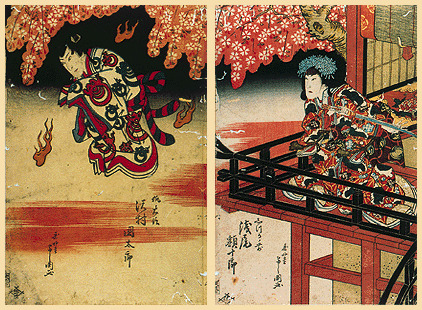 Kabuki performances had changed their methods from conversational styles to musical play styles. They took new style like the Bunraku puppet show, and the way, makeup, gestures and lines are regulated, is similar to Opera or musicals. The characters are real and tragic heroes, for Japanese people then and now, who know them and love them. The actor Ōishi Kuranosuke（大石内蔵助）, Plays the character Oboshi Yuranosuke（大星由良之助）, in the play "Kanadehon Chūsingura （仮名手本忠臣蔵）", Sugawara Michizane（菅原道真） in the play "Sugawara-denju Tenarai-kagami （菅原伝授手習鑑）" and Minamoto-no-Yoshitsune（源義経）in the play "Yoshitsune Senbon-zakura（義経千本桜）. The civilians were excited and enjoyed these plays, and going out to theaters. 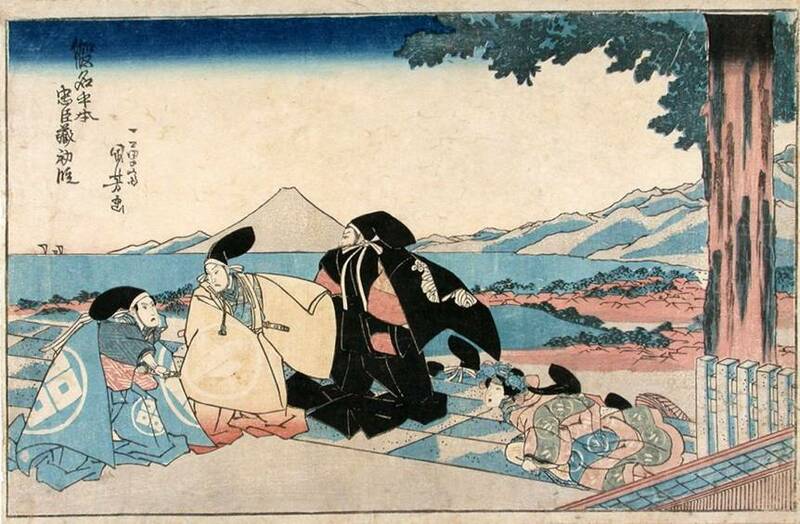 The beginning of the play Kanadehon Chūsingura. An act of revenge in the final scene. 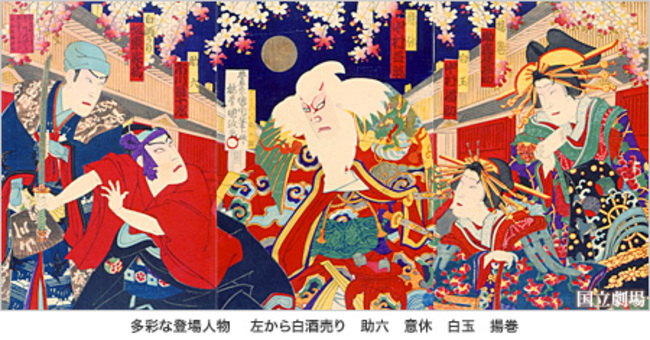 Let's research the reasons why it is said that they are the most popular Kabuki plays. First of all, they use very famous characters who were tragic heroes in Japanese history. These famous characters are: Oboshi Yuranosuke（大星由良之助）, in the play "Kanadehon Chūsingura （仮名手本忠臣蔵）", Sugawara Michizane（菅原道真） in the play "Sugawara-denju Tenarai-kagami （菅原伝授手習鑑）" and Minamoto-no-Yoshitsune（源義経）in the play "Yoshitsune Senbon-zakura（義経千本桜）. Second of all, these plays have been every kind of Japanese performing arts. Last of all, these plays have regular methods and traditional styles, and are easy to teach to next generations. It is said that this style comes from the performing art Gidayū Kyōgen（義太夫狂言）, which uses scripts based on shamisen music, Gidayū（義太夫 ）, and the musical story tellers, Tayū（ 大夫）who tell stories with music and songs. Kabuki actors perform plays which have been performed in Bunraku. These scenarios originaly came from Bunraku. These plays are based on historic occurrences and the play-writers made an aspect of travesty in that age, but also they are dramas which expand stories and have appearences from many characters. We can see Japanese sensibility and Japanese spirits through Kabuki. Kabuki theatre was a social place. Kabuki was a very popular entertainment during the Edo period. There was a town which was called Shibai-machi（芝居町）, (Play town), in the Edo period. There were playhouses mainly, and tea rooms, restaurants and souvenir shops and so on, and many residences for the people who were connected to the theatre. In this era, the entertainment district for men was a red-light district and the entertainment district for women was Shibai-machi. How civilians enjoyed these play performances is beyond the imagination of today's people. Kabuki plays started to enter the theatre in the early morning with the sound of drums. Civillians made lunch in the evening of the day before, and used Japanese lanterns to light the dark paths. They sometimes order a basket work palanquin to come to Shibai-machi. They dropped by Saruwaka-cho（猿若町） at Asakusa（浅草）, for them to have a rest and for the women to change their kimonos to new ones. And the young men from the tea restaurants led them to the theatre. The men changed their Japanese sandals to new sandals, Huku-zori (福草履）, with white clog thongs, which brings good fortune. And then, they reached their own seat, Masu-seki（枡席）, in front of the stage, or Sajiki-seki（桟敷席）, which is on both sides in of the stage. In the play house, civilians can feel that the place is another world, departed from the common world. 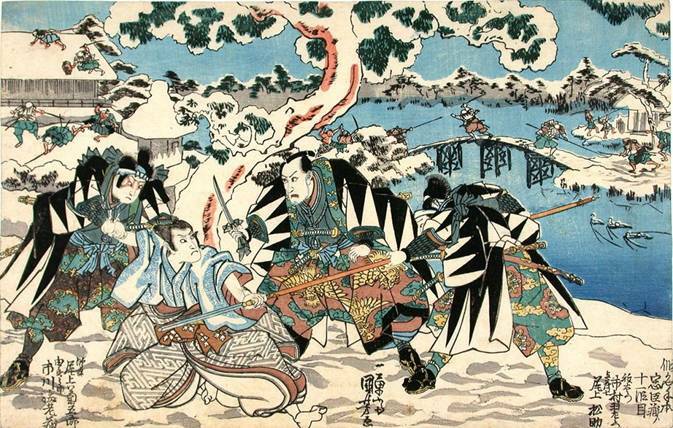 There were four positions, samurai, farmers, craftsmen and tradesmen in the Edo period, but within the theatre they didn't care about rank and became the same level. At the intermission between acts, civilians enjoyed eating lunch and drinking sake as the young girls changed their kimonos, and later came back to their seats. The theatre was also used as the place for marriage meetings. A matchmaker said "Please look at the girl who is sitting on the seat, the second Sajiki-seki seat from right at the first lane on the second floor." Then the young man looked at her very carefully without seeing a Kabuki show. On the other hand, the parents of the girl were evaluating him and thinking about him. It is only a custom during the Edo period. Now marriage meetings are held at other places. It's a very interesting thing. Yoshiwara was a social salon in the Edo period. I'd like to explain about Yoshiwara（吉原）, a red-light district in the Edo period. Yoshiwara was very important place connects Edo culture, Kabuki, music, dance and so on. Yoshiwara was one of the official red-light districts created by the Edo Shogunate, like Shimabara in Kyoto and Shinmachi（新町） in Osaka. These places were forgiven as a world free from every restriction of society. At that time, if a civilian has lots of money, he was called Daijin（大尽）, multimillionaires like a Daimyo. Yoshiwara was located at Sanya (Asakusa),（三谷/浅草）, where it had moved from the original location at Nihonbashi-Fukiyamachi( Nihonbashi-NIngyocho),（日本橋葺屋町/日本橋人形町）. Because of a great fire in the Meireki era, Meireki-no-Taika（明暦の大火）, it was completely burnt. after that the new Yoshiwara called Shin-Yoshiwara, but abbreviated as "Yoshiwara". And it was also called Hokkoku（北国）or Hokusyū（北州）,the meaning is that the place was located in the region north of the Edo castle. 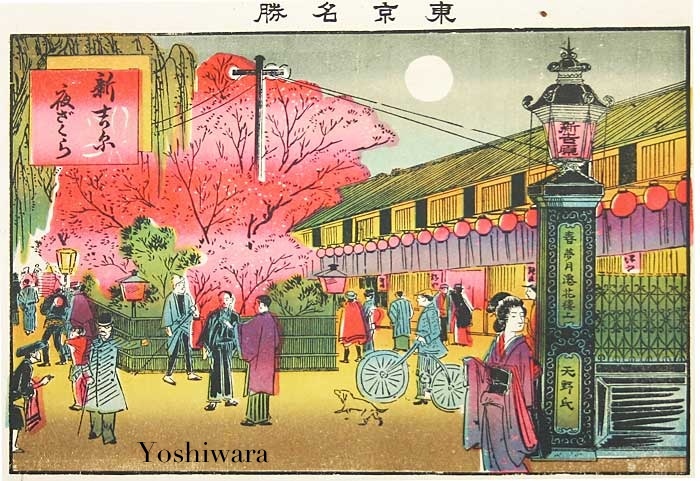 Yoshiwara: Kuruwa（郭）, the prostitute quarters was considered a social salon, a place of fashion, distraction and amusement for Daimyōs and people of culture. It's a quite different idea compared to that age and now. The first-class prostitute, Keisei（傾城）acquired education, could write tanka poetry, perform the tea ceremony and so on. During each day, the place resounded with the shamisen music of Kabuki, so there was a deep relation between Yoshiwara culture and shamisen music, Kabuki and dance. For example, a Kabuki play, "Sukeroku（助六）", is performed as a New Year play, and the location is in Yoshiwara. When people come to Yoshiwara, which was in a very lonely and withdrawn location, they needed to charter a boat, Choki-bune（猪牙舟）. it is a small boat shaped like a boar with a sharp tip, and it leaves from Yanagibashi（柳橋）. At the shipping houses, samurai put a Japanese wide brimmed cap that sometimes hides the face, Amigasa（編み笠）, it is made of rushes, that hangs over the face, and you can be only see from slits in the front. Monks take off their costume and formal garments. Servants, marchants and tradesmen change their cotton kimonos for silk kimonos, and get on a boat. Later they arrived at the shipping houses in Imado（今戸）, Asakusa, and get off the boat. Young men of the shipping houses lead them with chochin, Japanese lanterns, to Yoshiwara. This song, Hauta " Hukagawa-bushi（深川節）", is a song performed in an Ozasiki, a tatami room, as an entertainment form of music or dance, that really describes vividly the excited hearts of the customers who are looking forward seeing Yoshiwara geisha. This is the song "Hukagawa-bushi 深川節（葭町二三吉）"
Japanese people have many images of Yoshiwara. I'd like to explain about Yoshiwara from the point of view of Japanese traditional dance, Nihon-Buyō. It's the Kiyomoyo music "Hokusyū"（北州）, which needs great skill to dance because it is very difficult to describe the scenery and the many characters. This song is like passing a test to become a master of Nihon-Buyō. Yoshiwara used to be a gorgeous salon for samurai and civilians who admired it like a dreamy world. And some prostitutes, among them the first-class prostitutes, Keisei（傾城）or Oiran, were very popular and like today's celebrity singers or movie stars. They had sophistication, for example writing poetry, Waka and hospitable customs like the tea ceremony. The song, "Hokusyū", which called officially, "Hokusyū-Sennen-no-Kotobuki" （北州千歳寿）, was made as an elegant song for the situation of gifting. "Hokusyū" shows the north area from Edo and describes Shin-Yoshiwara, it was the new Yoshiwara, because the first Yoshiwara was burned. This song also explains about the four seasons. The lyricist is Nanbo Ōhta and the composer is Onao Kawaguchi. Onao was a geisha girl in Yoshiwara, and Nanbo had known Yoshiwara, he used to visit Yoshiwara many times as a customer. He was a famous Kyōka, comic tanka writer, his name is Shokusanjin （蜀山人）, he was a trendsetter and chic person, and at the time he was really familiar with classic events in Yoshiwara, with seasonal events, and quoting from the origin and history of Japan. This song is called "A poem of things in Yoshiwara with melody". It describes events of the four seasons in Yoshiwara and many vivid characters with beautiful Kiyomoto music. Japanese dancers perform this song using only one Japanese fan, Sensu（扇子）, to describe many characters, as many as 20 people, for example men, women, Tayū; the first-class prostitute, Keisei （傾城, Oiran: 花魁）, Shinzō（新造）; a new prostitute, Kamuro（禿）; a girl who works for the first-class prostitute. ,Hōkan（幇間）, a customer who gets drunk, Samurai and a driver, from an event in the New Year in Yoshiwara to the ring of the bell at the last day of the year. This performance is very exciting although it's hard to perform as dancers. Oiran-Dōcyū; a special performance of walking slowly on the Naka-no-chō street. I'd like to explain about the relationship between the dance for celebrations and the prostitute quarters. The origin of prostitutes is from maidens in the service of a Shinto shrine. The founder of Kabuki dance, Izumo-no-Okuni, who was called a medium of Izumo-taisya（出雲大社）. There was a group of performing arts in the Heian period, it was called Kairaishi（傀儡師）; an entertainer who was itinerant and used puppets. Later these entertainers became entertainers for Sarugaku（猿楽）; This performance is the origin of Japanese Noh and Kyōgen. Kairaishi changed to Watari-Miko（渡り巫女）; who were traveling many places seeking shrine festivals, events and markets, and sold talismans and purified charms, and in one aspect to be prostitutes. Left Photo: Izumo-no-Okuni at Shijō-Ōhasi bridge in Kyoto. When you listen to the lyrics in this Kiyomoto music "Hokusyū", you can find the words "Mise（見世）Sugagaki（菅掻）". It is shamisen music which was performed by prostitutes in front of the house to invite guests into Yoshiwara. This situation is the change from Summer to Spring, the wind is fresh and blowing, there is the sound of shamisen music welcoming customers in front of the Geisha house. 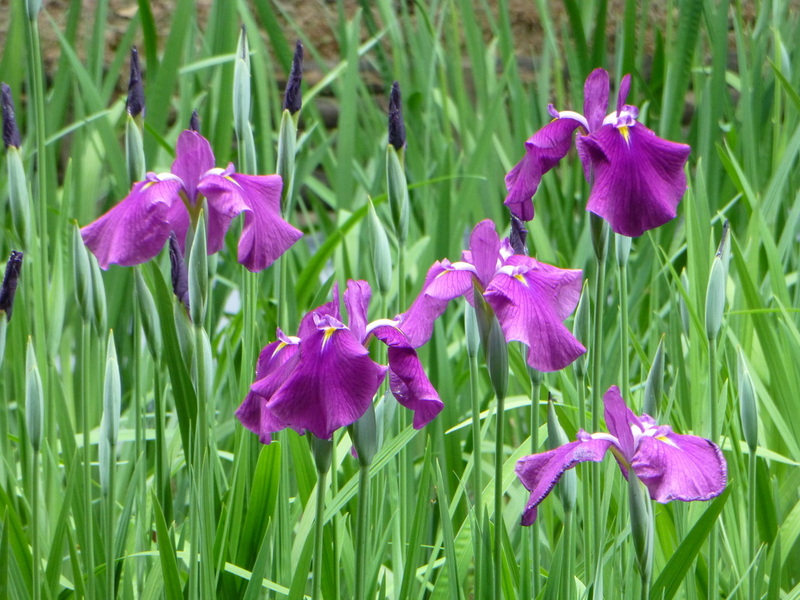 There are bamboo blinds and you can hear the sounds of the Summer bird, Hototogisu（ほととぎす）(a cuckoo), and you appreciate the blooming irises in May. "Sugagaki" music came from musical offerings to the Gods of Shintoism, Kagura（神楽）. And it was used for the beginning of working, like a special event or show, for the first-class prostitute, Keisei or other prostitutes. This is the connection between Kagura music and the performance of prostitutes. These two sections are part of Japanese traditional dance. If you want to learn more please check the dance section.